A hot and delicious Keto Cheese Croissant will become one of your family’s favorite Sunday morning meals. Preheat the oven to 385 F and line parchment paper on a baking sheet. Add the cheese and cream cheese to a large microwavable bowl, stir and microwave it for a minute, stir and microwave it again for another 30- 60 seconds stir again until well incorporated. Stir in the beaten egg whites, coconut, psyllium husk and pinch of salt. Knead with your hands until you achieve a dough consistency. Add sparkling water and continue kneading, if the dough becomes hard, microwave it for 10- 15 seconds. Place the dough between to sheets of parchment paper and spread with a rolling pin to ⅓ inches thickness. Brush the melted butter onto the dough. With a pizza cutter start by dividing the dough dough into 4 equal square, then into triangles, around 4 inches wide at the bottom. Roll the triangles up starting at the wide part, slightly make a curve to shape these a little crescent. Place them on the baking sheet at least 2 inches apart. 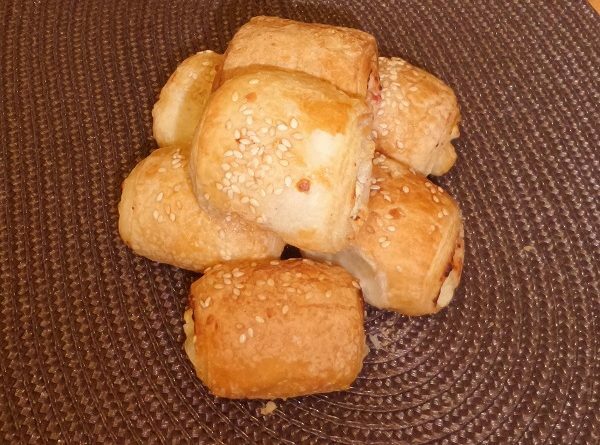 Brush with beaten egg yolk on top, sprinkled with sesame seeds and bake them for 12 minutes or until golden brown.